While it can be unpleasant to associate playgrounds and school grounds with lawsuits and litigation, the truth is that play areas for children can be dangerous and lead to preventable accidents. By diligently pursuing your legal rights following playground and school ground accidents, you may be able to obtain significant compensation and ensure that unsafe conditions are eliminated. 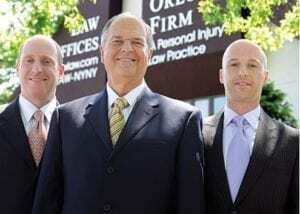 We believe you should expect the best from any personal injury law firm you hire. The attorneys of The Orlow Firm have handled hundreds of personal injury cases, including numerous cases involving dangerous playgrounds and schoolyards. When you work with us, you will speak directly with a partner at our firm. If your child has been injured, we can help you hold negligent parties accountable for those injuries. Contact us for a free initial consultation. Call (646) 647-3398 or contact us online. Defective playground equipment or lack of maintenance? Playground injuries can happen because of these or many other reasons. For many parents, it can be difficult to tell a childhood accident from a preventable accident caused by negligence. Our law firm can investigate an accident and determine whether you have a claim for financial damages. We have more than 30 years of experience and have handled many personal injury cases, but we understand that each case is different — including your child’s accident. Often, parents of children injured on playgrounds are reluctant to pursue a lawsuit because they think that the incident was just an accident. Many people are surprised to learn that some injuries to children are, in fact, both preventable and actionable under attractive nuisance laws. The attractive nuisance doctrine holds that if property owners have reason to expect that children will be on their property, they are responsible for keeping those children safe from harm. An attractive nuisance can be something that would tempt children to enter someone’s property, such as playground equipment. If your child was injured on a playground, do not assume your case is not actionable. Cases can involve anything ranging from falls and crushing to burns from overheated ground mats. Contact the experienced Bronx premises liability attorneys at The Orlow Firm if your child has suffered a playground injury. We offer free initial consultations and operate four offices across New York City for your convenience. We can go to you if you cannot come to us. To contact a lawyer, call (646) 647-3398 or send us an online message.